In order to build from sources, you will need the latest Dev-Cpp IDE version, with the MinGW tools. Download it from here. Open PandoraAgent.dev with Dev-Cpp and construct the project. Everything should compile fine in a default installation. If you found any problem when building from source, please contact us by email (ramon.novoa AT artica DOT es) or the SourceForge project web. Go to http://sourceforge.net/projects/devpaks/files/ and download the file openssl-0.9.8e-1cm.DevPak. \pandora_agent.conf  :: Pandora Windows Agent main configuration. \key\                :: Directory which holds the private and public key files. \key\id_dsa          :: Private key to access the Pandora server using SSH. \key\id_dsa.pub      :: Public key to access the Pandora server using SSH. The Agent will be installed into the Windows services system. You can check it on Control Panel -> Administrative tools -> Services. You can run it by clicking the "play button". To stop the service, open the "Services" dialog, search the "Pandora Agent" and click the stop button. The Pandora Windows Agent configuration is done via the pandora_agent.conf file. This file is special and has a own syntax. The file is a list of keys/values pairs. Here is an example of this file. # Please notice that if the directory has a blankspace, it must be between "
server_ip     : IP of the Pandora Server. Required. server_path   : Remote path of the incoming directory of the Pandora Server. Required. temporal      : Local path to the temporal directory. Required. include       : Alternative configuration file. Optional. broker_agent  : Manage configurations and data collections from an agent like several agents. Optional. agent_name    : Name of the agent. Optional (machine name by default). pandora_debug : Debug mode. Optional (off by default). The module definitions must be also in the pandora_agent.conf files. Please read underneath to learn how to define a module. There are two optional fields, one is the module_description, which defines a human readable description of the module, the other is module_interval wich defines the number of iterations between each module execution, for instance if interval is set to 30 and module_interval is set to 3, that module will be executed every 3 * 30 = 90 seconds. These modules execute a sentence provided in the definition. module_exec netstat -na | grep LISTEN | wc -l | tr -d " "
These modules check if a process is running in the system. It requires the full name, including the extension of the executable. Since monitoring processes may be critical in some cases, Windows agent now supports asynchronous checking for module_proc. This allow the agent to inform Pandora server whenever a process is down. In the following example, as soon as notepad.exe is closed and stop running, the agent will send a tiny XML including only the status of this module. These modules act like the module_proc, but checking if a Windows service is running. In a similar way like in processes, monitoring services may be critical in some cases. Windows agent now supports asynchronous checking for module_proc, allowing the agent to inform Pandora server whenever a service is down. In the following example, as soon as ServiceSched is stopped, the agent will send a tiny XML including only the status of this module. These modules get the amount of free space in the logical drive defined (please notice that the drive must have the :). The data is in MB. These modules gets the average percentage load of the defined CPU. It is possible to get the average CPU load on multiprocessor systems. This module get the amount of free memory. The data is in MB. This module returns the percentage of free space in a logical drive. This module returns the percentage of free memory. This module tries to connect to the given host:port. Returns 1 if successful, 0 otherwise. A timeout may be specified. generic_data_string: All lines that match the regular expression. generic_data: The number of lines that match the regular expression. generic_proc: 1 if there are any matches, 0 otherwise. For more information on the regular expression syntax see . Retrieves performance counter data through the PDH interface (pdh.dll must be installed). The logevent module has been improved from version 2.0. It now uses the direct API to load events from file, instead use WMI bridge, as uses in 2.0, this method is much more faster. It has been thoroughly tested on Windows 2003 and Windows 2008 (which uses the new XML based event system) and should work on other versions too. As you can see, could be easy to missunderstand the meaming of all fields. Main parameter is "Source" and this defines the windows log (Application, System, Security and others) where to search. 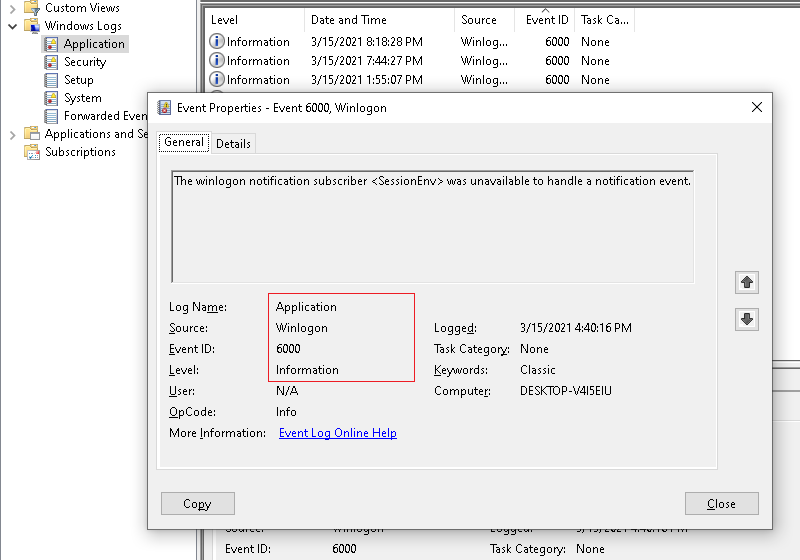 Application defines the source of the event inside the windodows log. All this parameters are case sensitive. A full example, matching the event in the screenshot. Type of module that allows you to obtain information about Windows logging channels. 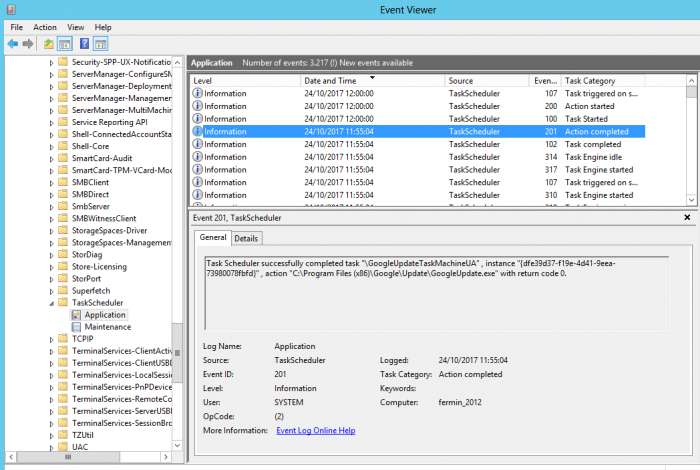 Although module_logevent only has access to Windows Logs, this type of module allows you to extract data from other log files that are configured as channels. In this way, it is possible to obtain the logs included in the services and application logs. To avoid displaying repeated information, only those events that have occurred since the start of the agent are taken into account. module_source: Event channel. With the command wevtutil. exe enum-logs a list of all the local log channels of the machine is obtained. Required field. module_pattern: Pattern to search (substring). Optional field. module_eventcode: Numeric ID of the event, e.g. 5112.Optional field. See below Inventory Module under New Feaures. Please notice that this will not stop the agent, which has to be stopped manually. In the next restart of Windows, the Pandora Agent will not be in the Windows services system. Another need may be reopen any process that was unexpectedly stopped. Pandora Window agent can now open any monitored process and work like a watchdog. Since opening a process might require some parameters, there's a new configuration line for this module. Notice that it only works when the module is set to be asynchronous. Here's an example of how to configure a module_proc module. module_retries: Number of consecutive times the module will try to launch the process before disabling the watchdog. If the limit is reached, the watchdog mechanism for this module will be disabled and never will try to launch again the process, even if this proccess is recovered by the user. To get the watchdog system restarted, you need to restart Pandora FMS agent. Please note that there is no limit by default on retry. module_startdelay: Number of milliseconds the module will wait before launching the process for the first time. This is a good idea to setup a value of 5000 (5 secs) here for example if your process take a lot on load in system. module_retrydelay: Number of milliseconds the module will wait before launching the process after a failure. Has the same meaning that module_startdelay, it's used to "wait" until process completely load on system. module_user_session: It controls in which session you want the process to be launched. If set to' no', the process will start in the services session and therefore remain in the background (default setting). Otherwise, if set to' yes', the process will be launched in the user's session and will be visible from the pc desktop. A secondary server can be defined in pandora_agent.conf. The configuration options are the same as for the primary server, preceded by secondary_. on_error: Sends data to the secondary server only if it could not be sent to the primary server. always: Always sends data to the secondary server, even if it was already sent to the primary server. Pandora FMS's Windows Agent runs a UDP server that allows it to receive commands from the web console. udp_server: Set to 1 to enable the UDP server. udp_server_port: Port the server listens on. 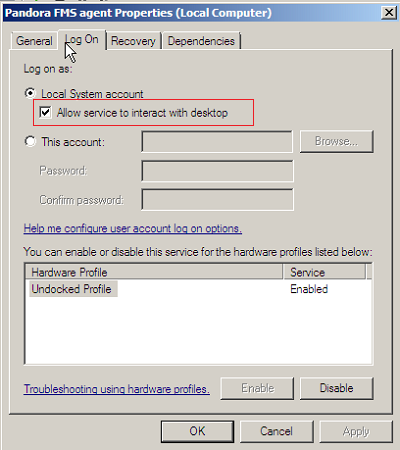 udp_server_auth_address: Addresses authorized to send commands to the UDP server. process_<name>_start <command>: Local command to start a process. process_<name>_stop <command>: Local command to stop the process. service_<name> 1: Allows service <name> to be started or stopped. Agent execution can be forced at any time from the web console. module_wmiquery: WQL query to run. Several rows may be returned for string data types. module_wmicolumn: Name of the column to be fetched. Using predefined WMI queries this module retrieves information about different aspects of a the machine, from sofware to hardware. CPU: Gets information about the CPUs on the system (Processor Name, Clock speed and Description). CDROM: Gets information about the CDROMs (Name, Description and Drive letter). This module has also an optional module_interval line used to specify the interval (in days) to get this module information. Voilá!. You have now a CPU global usage counter. There ara a lot more VBS stuff you can use for your own modules. Just checkout excelent documentation from MSDN .